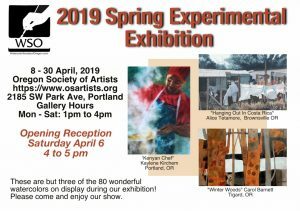 We would like to invite you, your family, friends and colleagues to attend our exciting new 2019 Watercolor Society of Oregon (WSO) Spring Experimental Exhibition. The exhibition will be at the Oregon Society of Artists (OSA), 2185 SW Park Ave, Portland OR from April 8th to 30th. Gallery hours are Monday through Saturday, 1 – 4 pm. The exhibition will feature 80 experimental water-media paintings by Oregon artists. The opening reception for the exhibition will be Saturday, April 6th from 4 to 5pm. For more information about the gallery, please contact the Oregon Society of Artists. 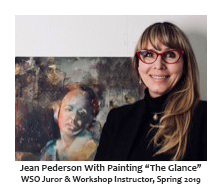 At this time, you will be able to meet Juror Jean Pederson, many of the WSO artists, and see which paintings have earned awards. The show features 80 fine water-media paintings by artists from locations around the state of Oregon. The WSO website has a complete list of the 80 paintings. What makes this show special is that experimental water-media pieces are accepted into the exhibition. That is, member artists may be creative about the supports (paper or board) they choose. Also, they can experiment with types of water-based paint, including acrylic, gouache and transparent watercolor. Artists may add colored pencil, pastel and ink, for example, as long as the painting is mainly water media. One more thing, we would like you to know that all the paintings are for sale! The show’s Juror is Canadian artist Ms. Jean Pederson. 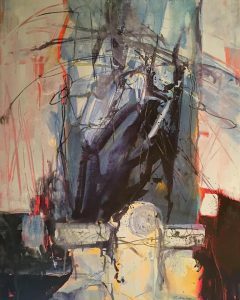 Ms. Pederson is a signature member of the American Watercolor Society and National Watercolor Society, among others. She is an author and workshop instructor as well. Her signature work is expressive portraiture. For more about Ms. Pederson, please visit her website. 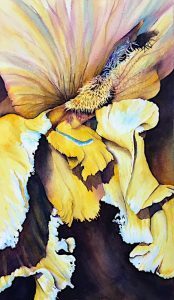 So, do stop by the Oregon Society of Artists gallery and see the exciting and creative water-media paintings done by Watercolor Society of Oregon artists.